Steven Bradbury Jr. aka "Doc Jones" co-owns Lithermans Limited Brewery. 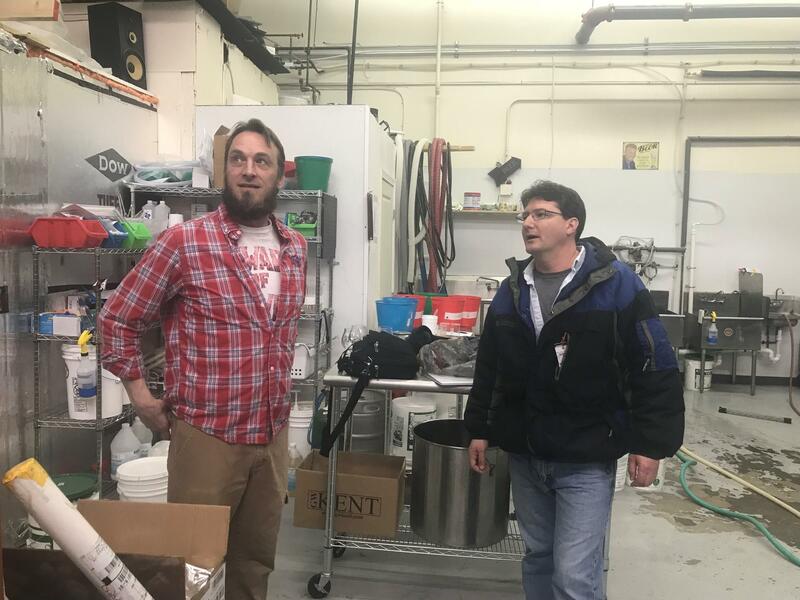 Co-owner of Lithermans Limited Brewery Michael Hauptley-Pierce, left, gives Morning Edition Host Rick Ganley, right, a tour of the brewing room. In Morning Edition's series, Radio Field Trips, we're traveling across the state to bring you stories of New Hampshire life and culture. This week, we thought we'd grab a beer. 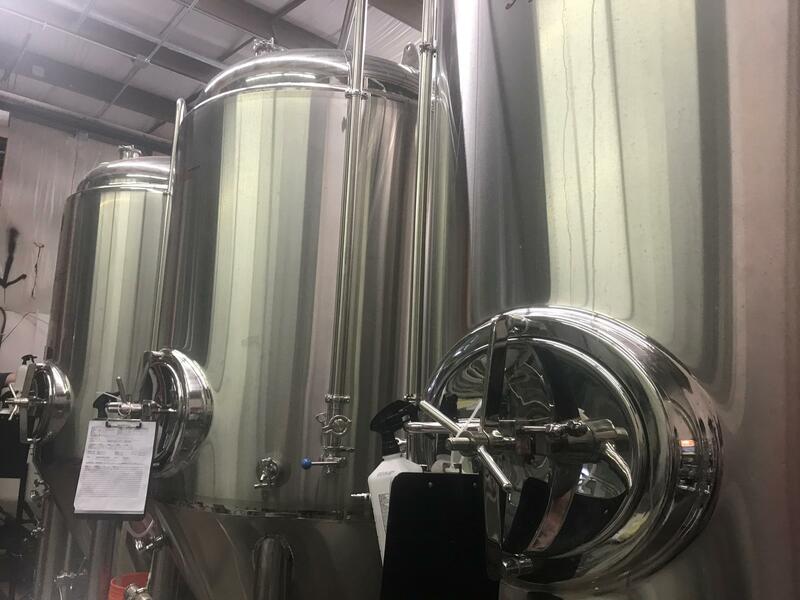 Morning Edition Host Rick Ganley and producer Mary McIntyre visited an up-and-coming craft brewery in Concord. 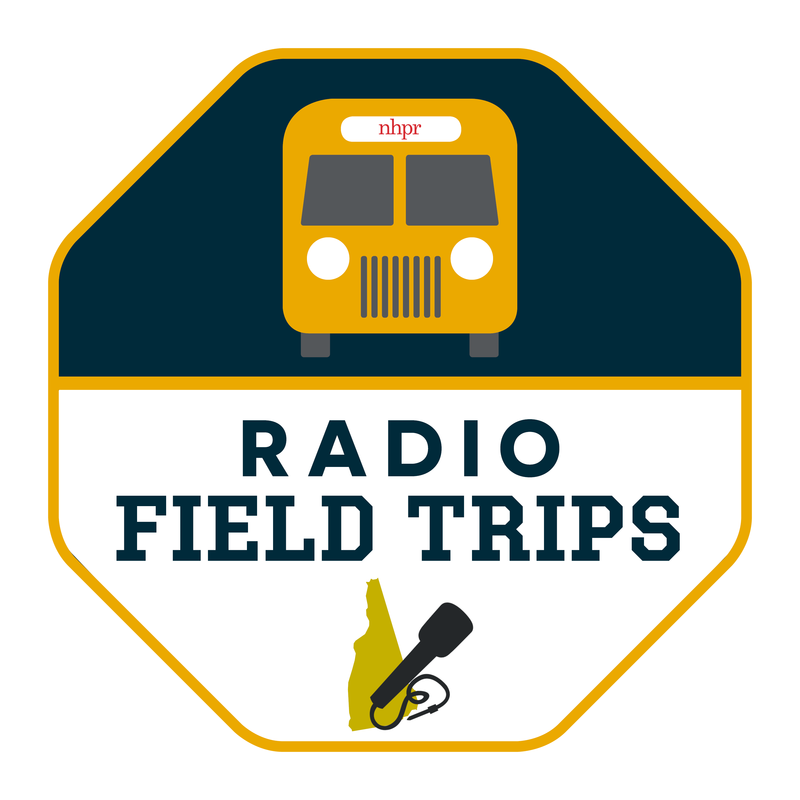 Do you have a suggestion for an upcoming Radio Field Trip? Click here to send us an email and let us know! The brewing room at Lithermans Limited Brewery is filled with people working together on a new recipe. Whirring, complicated looking machines line the walls. This includes four giant, metal tanks that stretch from floor to ceiling. Co-owner Michael Hauptley-Pierce says usually all four of the shiny tanks are full at a time. He says the brew his apprentice is working on this morning is one of their most ambitious yet. The name of the new brew? Pink Boots Made for Walking – just like the song “These Boots are Made for Walkin’” by Nancy Sinatra. It’s obvious right away music has a huge influence in the production and packaging here. Posters of labels from their signature brews line the walls of the tasting room – each named with a music pun. Some of the names include Red Raspberry Beret, Bowow Yippee Oh IPA, Tangled Up in Bruges. You get the idea. Michael and his business partner Steve Bradbury Jr., who’s better known as Doc Jones, have a history long before brewing. Doc says the two actually started out as a hip-hop group. But Michael says the music never really went that far. But soon after, the pair began home brewing together for fun. And although their obscure hip hop group wasn’t working anymore, their experiments with craft beer were. And slowly over time Lithermans grew into a business with a tasting room, signature recipes and a group of regulars. A long list of over a hundred brews are scribbled onto a beam behind the bar. It includes every one the pair has made together. The process of coming up with names for their signature brews seems a bit like songwriting. Michael says lyrics will jump out at him while listening to music. “Almost like it was highlighted, and it’s like that’s a beer name right there, or a bad pun on that is a beer name,” Michael says. Wherever the ideas come from, the partnership is working. 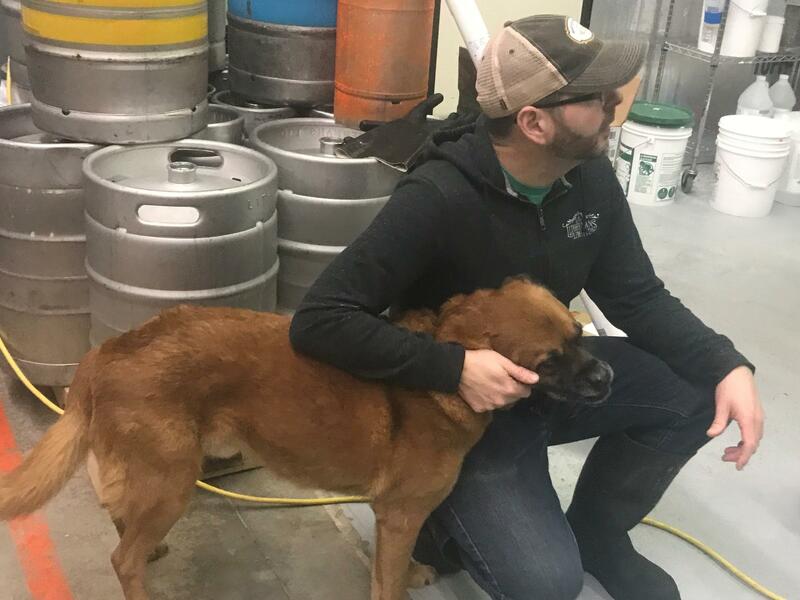 The brewery is expanding, and it’s coming up on its second anniversary. Do you have a favorite place in New Hampshire that you’d like to show us? Let us know by sending us an email here. In Morning Edition’s new weekly series, Radio Field Trips, we’re traveling across the state to bring listeners stories of New Hampshire life and culture. If Dave's voice sounds familiar, its because he tells some of the stories you hear on NHPR's Something Wild. He also has a 40-acre tree farm where he enjoys his hobby of turning sap into maple syrup. In Morning Edition’s series, Radio Field Trips, we’re taking you to places in New Hampshire you may not have heard about. 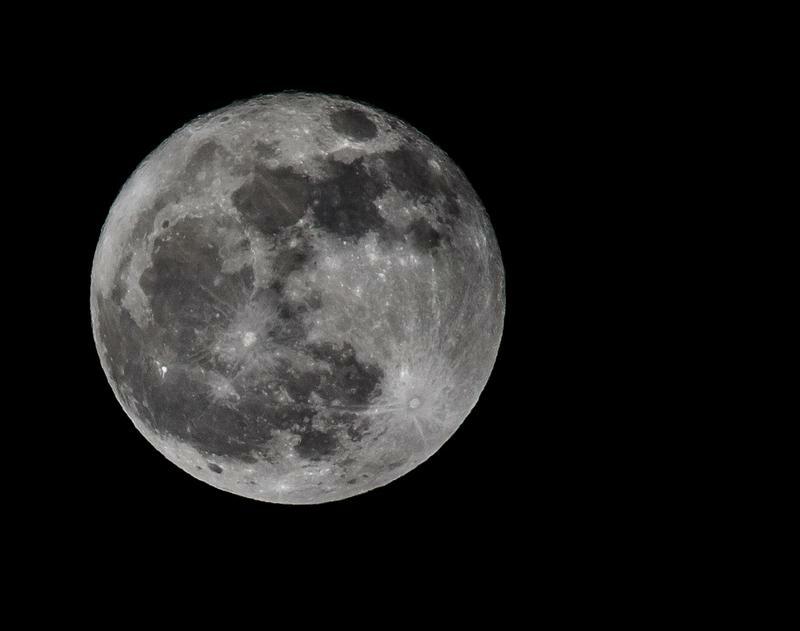 For our latest story, Morning Edition Host Rick Ganley and producer Mary McIntyre visited Prescott Farm in Laconia for a moonlit night hike.